Marie- Theres Härtel was born 1983 into a family of musicians and grew up in Citoll by Deutschfeistritz. 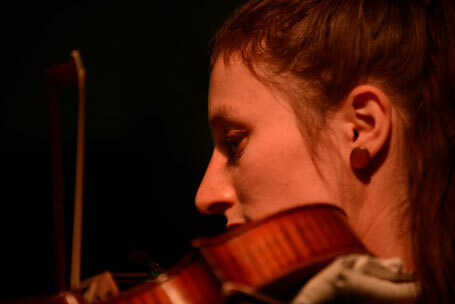 She is a founding member of the band NETNAKISUM and completed her studies of classical viola with Gertrud Weinmeister in Vienna with distinction. As both performer and teacher, she is sought after internationally. Her musical journeys have brought her to China, the USA, Africa and through Europe. Härtel has worked on numerous projects: at the Grazer Oper, in diverse orchestras, with the Frei Theatergruppe Göttingen, the WDR Big Band and many more. From 2011-2015 she lived in Berlin where she engaged deeply with contemporary dance and improvisation. Currently she is performing with: the MOVE STRING QUARTET, the DUO HÄRTEL TRÜBSBACH and the KUSIMANTEN.